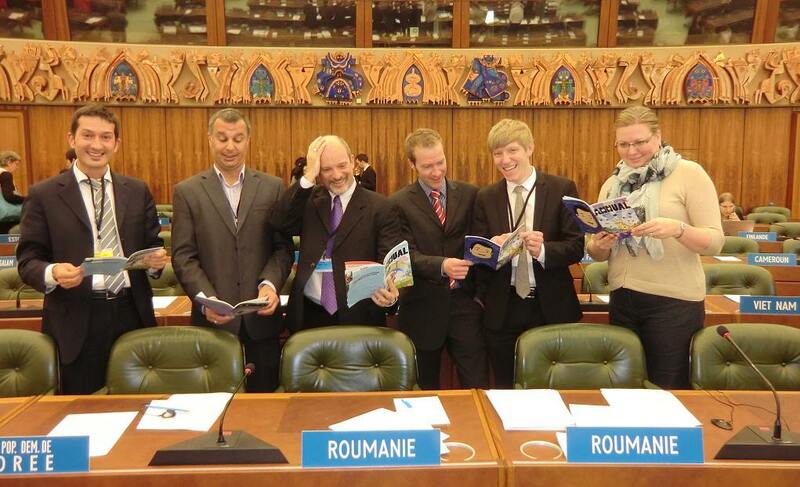 UN delegates, Camille from France, Victor and Greg from Australia, Phil and Nick from England, and Kathleen from Canada enjoy The Annual on the floor of the United Nations World Intellectual Property Organization building in Geneva, Switzerland. It’s reported than an unnamed member of the group started reading it at one especially boring part of the day’s meetings and caught himself almost laughing out loud so he had to put it down. Whether you’re a UN delegate or normal citizen of any country you can order your copy of The Annual on the other side of this link! We’d also like to instate what is being called the Mad Magazine Challenge (named as such because Mad did it first): Send us a picture of yourself, and a celebrity (of any level) enjoying The Annual and we’ll give you a free subscription and print it in an upcoming issue.